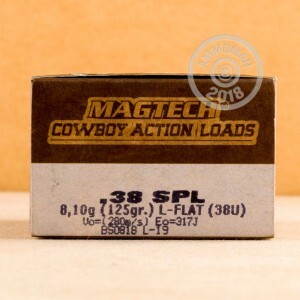 This .38 Special ammunition is optimized for cowboy action shooting. 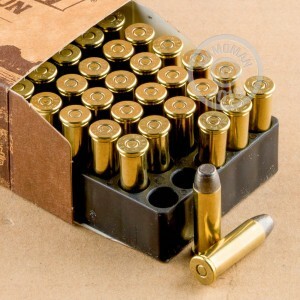 Each cartridge in this box of 50 fires a 125 grain lead flat nose bullet at 919 feet per second. The flat-nosed design of this ammo makes it suitable for long guns and revolvers alike. These Brazilian-made cartridges use non-corrosive Boxer primers and brass cases. Though it has roots in earlier 19th century cartridges, the .38 Special is something of a convenient anachronism in action shooting. It was introduced in 1898 to replace the significantly weaker .38 Long Colt and served with lawmen long after the Wild West ceased to be 'wild'. Notable .38 Special firearms include the Colt Official Police and the S&W Model 10--classic revolvers notable in their own right, but hardly cowboy guns! 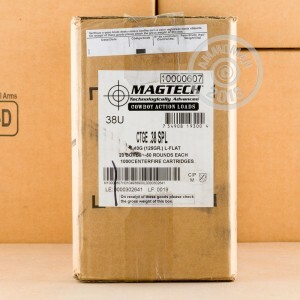 Ballistically, however, the .38 Special fits right in with other popular action shooting cartridges as it can be loaded to fire a lead nose bullet at a relatively low velocity--an ideal combination for steel targets. In addition, .38 ammo has the added advantage of being cost-effective. It's especially inexpensive when purchased in volume from AmmoMan.com, where all orders over $99 ship for free!